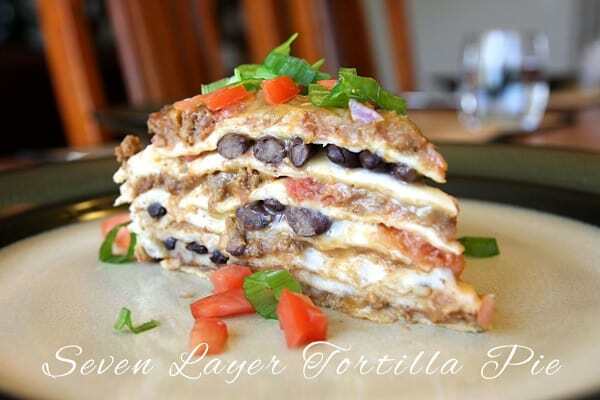 Considering how much I love seven layer dip, I was pretty sure this Seven Layer Tortilla Pie would be amazing! And I was not disappointed. The original version of this tortilla pie didn’t include meat. I added some ground beef for my husband, who besides being a carnivore, isn’t a big fan of beans. I prefer the meatless version myself–although it would also be fabulous with shredded chicken. This loaded savory pie is surprisingly filling, with or without meat. So unless you’re feeding 6-8 hungry people, you can plan on leftovers. This is great topped with salsa, sour cream, chopped tomatoes and sliced green onion. In a large skillet over medium heat, brown ground beef until done; add taco seasoning and cook according to package directions. Stir in re-fried beans, red onions and garlic. In a separate bowl, mix together Rotelle, cilantro, and black beans. Place 1 tortilla in a greased pie plate or tart dish. Spread 3/4 cup meat and bean mixture over tortilla to within 1/2 inch of edge. Top with 1/4 cup cheese, and cover with another tortilla. Spread with 2/3 cup black bean mixture, and top with 1/4 cup cheese. Repeat layering twice. Cover with remaining tortilla, and spread with remaining meat and bean mixture. Top with remaining cheese. Cover with foil, and bake in preheated oven for about 40 minutes. Cut into wedges and serve. I didn’t love it, but my family loved it a lot! Tried this recipe last night. Pretty darn good. Next time I might try some more veggies and a little ricotta cheese. The Italian in me is feelin’ Mexican lasagna! Great recipe! Thanks for sharing. WOW!!! Posting up at Midchix! Sending you some Link Love! Wow, this is so cool! I love dishes that are layered, so I’m going to have to try this one soon. Until then, I still have to try Layered Tostada Bake. 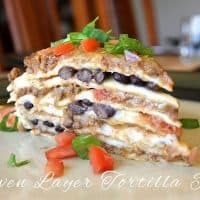 I’ve found so many Mexican recipes that are layered. Does anyone know why? I haven’t made a tortilla pie in forever! I need to revisit this recipe – looks great! My kingdom for a fork to dig into THAT! That’s one regal looking tortilla pie. I just found your blog via Tasty Kitchen.. I love it! and I can’t wait to try this recipe and so many more!! delish. Saved this one too, new follower. Looks yummy and baking in the oven as we speak. I added black olives. I’ve made this twice, it’s a new family favorite.